Great to be back....thanks to all for their work in getting this site back on-the-air. Doing a loop from CA through GTNP/YNP arriving May 10 and leaving May 16, then onto Moab/Arches. 1) I see that Dunraven is closed until end of May...is this a hard date or a "conditions permitting" date? 2) Weather...50's/20's is average (right? )...so pack for winter/spring conditions? 3) Staying at Signal Mountain Lodge May 11-16, Jackson on May 10. Is the museum/gallery still there up on the hill overlooking the Elk Refuge? Float trip on the snake and visit Oxbow bend for pictures also on the agenda. Maybe the barns. 4) Does Dornan's still have the Monday night Hoot? 5) For the locals, I see near record snowfall for the Tetons, but YNP looks clear at Mammoth and North, what about Canyon and Northeast? Saw 6-8 ft still at Lake on the YNP facebook page. Can't answer many of your questions, but on Dunraven, it's not a hard date in that it might open later than late May if they haven't finished plowing. It won't open earlier, even if they have it clear. Weather can be about anything, from winter to warm. There's been significant snow in much of the park this winter, even Mammoth and Gardiner have had snow. The northeast section and Cooke City have been hammered with snow and are still getting it. I love trips in May. Best time to see baby animals, bears are often near the roads grazing. I would plan on a little warmer if it's sunny,I have seen temps mid sixties to low seventies,and yes the night time temps can get down there around twenty seven or so. On water activities might be dicey,high flows might keep outfitters off the river for saftey.Yellowstone Lake and Lewis Lake will still have ice,even in drier years this would be true for the second week of May,this year could be like May of 2008,this pic(5/10/08) is of the Snake River at Oxbow Bend looking east and the river is still frozen over,the canoe launch at String Lake was three feet deep of snow. I sure hope that you're planning on staying in motels...that will make it much easier for you and your SO. I live along the north slope of the Beartooth Mtns and there's lots of snow in the high country right now. It's not very warm either. 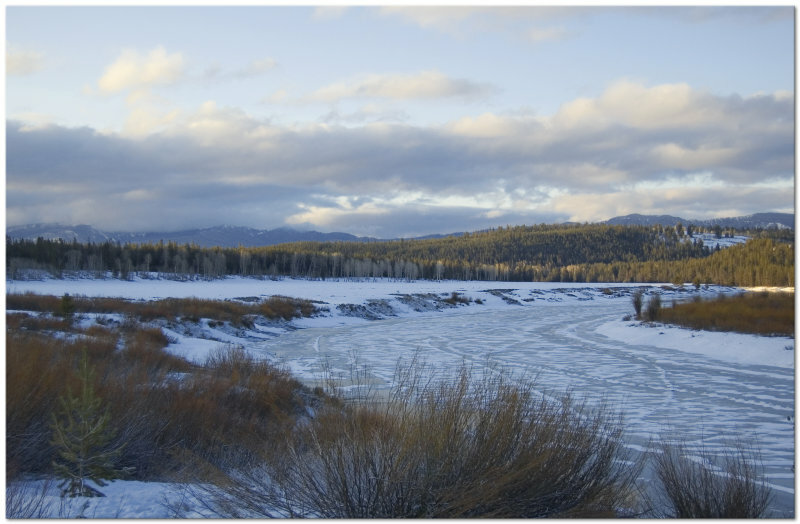 May is usually considered a transitional month in the Greater Yellowstone/GT region. And, historically, there's usually a fair amount of moisture. So you need to be prepared for rain and/or snow and some possible road flooding since the mountain runoff typically begins in early May. Make sure that you're well prepared with respect to your clothing and that your car is properly equipped for mountain driving and winter weather. Hopefully, the weather will be nice when you're in the Parks. But, you just can't count on it. Historically, the late spring snowstorms are the worst...lots of wet heavy snow and slush that can make driving very difficult and sometimes even treacherous. That being the case, make sure that you've got a tote box in your car trunk that has jumper cables, a snow shovel, emergency road flares, a couple of flash lights, a good first aid kit, sleeping bags/blankets, a snow/ice windshield scraper, a portable cook stove, some EZ to cook meals, utensils and plates. Basically, you need a survival kit just in case you get stuck or go off the road because it might take a while before anyone sees you or that you need help. The Park road crews do a terrific job clearing the roads in the spring but only they can do so much when a bad spring snowstorm hits unexpectedly. And if it's snowing heavily, the crews might hold off plowing the roads until the snow stops or is close to stopping. So make sure that you've got enough warm clothing, food and gear on hand and that your car is ready for winter snow conditions just in case Mother Nature decides to be ornery and extend the winter. FYI:This winter was the worst winter on record according to our neighbors....several nights were 30+ below zero and the snow never let up. Today, however, it's sunny, it's supposed to be in the 50's and all my wild buddies are back, enjoying the beautiful spring weather. Pretty nice considering we just missed a spring storm that was supposed to dump 3' of snow on us. Hope you and your SO have a wonderful time on your trip. Just remember that when it comes to safety and your well-being, it's always better to be over-prepared when visiting the high country because mountain weather is so unpredictable. Thanks to all for their comments. Been 9 years, way too long. Packing shorts and parkas and boots and sandals...IOW, Rockies in spring time clothes. The Museum is on the side of a hill overlooking the Elk Refuge. SML is showing that they begin their float trips on May 12 so you may get lucky but I would expect that it will be quite cold on the water but also quite lovely!! It doesn't look like the lake cruise in YS begin until June 11 but maybe I am misreading the website? Usually when we have gone in May, even late May there has still been a fair amount of ice still in/around Lake Yellowstone, even when it wasn't still frozen Which is has been at least once. Having said that, we love going in May. It is usually not that crowded, the animals are near the roads, bears are out in droves and the employees are still happy! We were just there last weekend (April 20, 21) and the snow is melting pretty good in the northern Sections of the park. Lamar Valley still has snow but around Slough Creek and Mammoth it is pretty much gone. We were able to hike the road to Slough Creek Campground without much snow. The road to Tower was still mostly snow covered. In the Tetons there is still some snow in the valley but bare patches are showing. Oxbow Bend is mostly ice free.